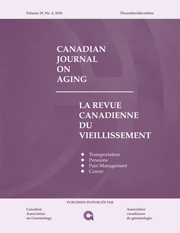 The Canadian Journal on Aging / La Revue canadienne du vieillissement (CJA) is a refereed, quarterly publication of the Canadian Association on Gerontology. It publishes manuscripts on aging with a focus on biology, health sciences, psychology, social sciences, and social policy and practice. The Journal welcomes articles reporting original research, as well as conceptual and theoretical papers that significantly advance knowledge or understanding in gerontology. Journal space is also available for Research Notes and Policy and Practice Notes. A Research Note is a brief research report with theoretical or policy implications. A Policy or Practice Note is a brief report with implications for improving practice or the delivery of a specific service. Canadian Association on Gerontology. This publication is supported in part by grants from the Social Sciences and Humanities Research Council of Canada (SSHRC) and the Institute of Aging, Canadian Institutes of Health Research (CIHR).